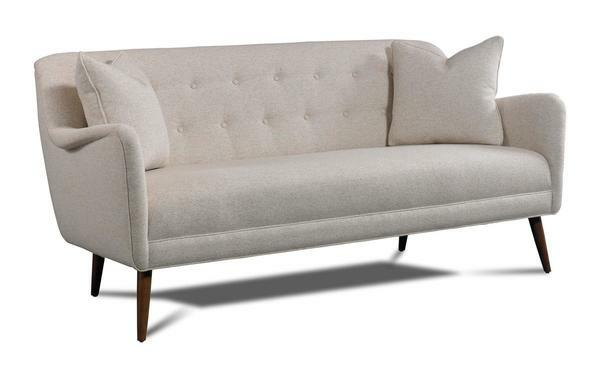 The Suri Sofa by Precedent shows off her mid-century modern style legs that support a clean, understated framework that shines in a modern living room collection. The Suri Sofa has a simple and shapely form, with gently rounded arms and one long continuous seat cushion. The button back detail is crisp and fresh and contributes to Suri's mix of natural and spunky. If you like a tidy, continuous sofa back versus lots of loose cushions, the Suri Sofa is a great candidate. A kiln-dried hardwood frame. Kiln-dried wood is stronger and resists bending and warping. The frame comes in your choice of finish and is guaranteed for life. Upholstery options include your choice of Standard, Performance Plus and Specialty Fabrics. Performance Plus fabrics are treated with Crypton technology, making them ultra resistant to wear, stain and odor. Crypton fabrics are also easy to clean when spills do occur. Order samples to work with from our exciting collection. Precedent Furniture is built in North Carolina with the finest materials available. With a commitment to quality, style and value, Precedent has been crafting this American made furniture for over thirty years. This is luxury home furniture that's built to last. Please email or call us with any questions you may have. We can be reached toll-free at 866-272-6773.